Product information "4 x Krombacher Pils fresh kegs, 5 liters of 4.8% vol"
it works standalone. You don't Need any System. So light you have never tapped! Discover the power take-Sensation, exclusive of Krombacher: Whether at home or out in the open - the new deposit-free 5l keg with integrated Easy-pin system Allows you everywhere professional journals without additional tap! After tapping enjoy up to 30 days fresh beer enjoyment. With practical handle the ideal traveling companion. 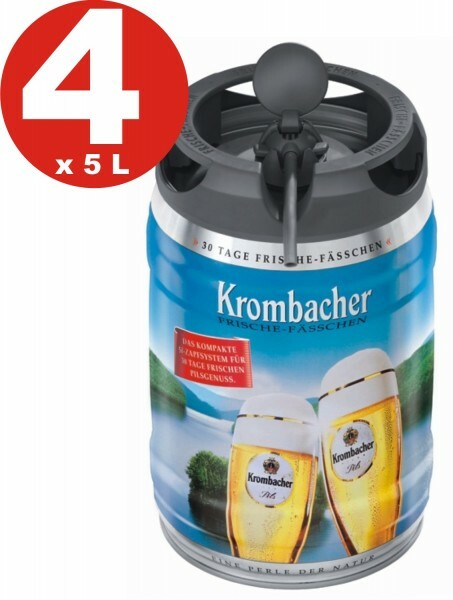 Related links to "4 x Krombacher Pils fresh kegs, 5 liters of 4.8% vol"
comment "4 x Krombacher Pils fresh kegs, 5 liters of 4.8% vol"
Customer evaluation for "4 x Krombacher Pils fresh kegs, 5 liters of 4.8% vol"